Secretary of State John Kerry got the money shot he wanted on Tuesday - the chief negotiators for Israel and the Palestinians framed by his lanky embrace as they shook hands to launch "sustained, continuous and substantive" talks on a long-sought Middle East peace treaty. Now the question is whether the negotiations expected to last nine months will bring an even more historic image, with President Barack Obama bringing together Israeli Prime Minister Benjamin Netanyahu and Palestinian President Mahmoud Abbas to sign a final-status agreement that creates a sovereign Palestinian state in what is now part of Israel. The Middle East dispute, perhaps the world's most intractable in the past six decades, entered a new phase with Kerry's announcement that the first direct talks in three years would proceed in earnest in the next two weeks in either Israel or the Palestinian territories. 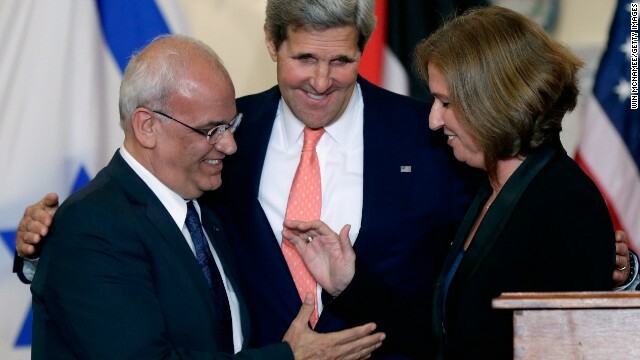 Flanked by Israeli Justice Minister Tzipi Livni and Palestinian chief negotiator Saeb Erakat, Kerry said "all core issues" toward achieving a two-state solution would be on the table. "Saudi activist receives 7-year sentence, 600 lashes for insulting Islam." Gee really? It should say, "Sentencing someone to 7 years and 600 lashes MAKES Islame INSULTING". Stupid Towel Heads. There will NEVER be peace in Towel Head land until Islame moves to the 21 century (which will be NEVER!!!). This is just theater – Israel doesn't want peace, it wants Palestine, and any cursory study of Netanyahu, Likud, or political Zionism generally will absolutely assure you of it. The Jews of the US, Canada, and Europe are the most powerful single ethnic group in each of those countries, while the Plaestinians have no power at all. Little wonder that Israel has not only been able to commit ongoing ethnic cleansing and war crimes, but otherwise intelligent people work to convince the world that pointing out these crimes is "anti-semitic". Orwell would stand, awestruck, in amazement of the success of the Zionist propaganda and narrative, which has succeeded in turning up into down and black into white. Intelligent people would also understand the meaning of ethnic cleansing and considering that Palestinian population has increased every year for the last three decades, your claims are not only idiotic but show that the Arab and Palestinian propaganda has worked well on you too! Just keep denying the facts and continue to spew your empty rhetoric and you will find that it is no use. You are on the wrong side of history and fighting a futile battle that cannot and will not be won! There are 1.5 million Israeli Arabs with Israeli citizenship, full rights and a party in Israeli parliament living inside of Israel. Please remind me, what happens to a single Jew if he or she crosses to West Bank or Gaza Strip? "...Israeli Prime Minister Benjamin Netanyahu and Palestinian President Mahmoud Abbas to sign a final-status agreement that creates a sovereign Palestinian state in what is now part of Israel." I'm afraid that Tom Cohen does not know what he is talking about. The West Bank is NOT part of Israel. It is NOT part of ANY country. West Bank is inside of Israel my friend, and Israel is the only country in the region that is willing to let Palestinians live on its soil, not even one Arab nation excepts Palestinian refugees, that is a fact. This is so wrong – our country shouldn't even be involved in this!!! Bottom line: LEAVE ISRAEL ALONE!!! They own the land rightfully, biblically, legally, and morally. The Palestinians do NOT have any legal claim to Israel. What we(the USA) does to Israel, or allows to happen to Israel, God will do to us and/or allow to happen to the USA exactly what we allow to happen to Israel. Medal of Honor recipient Col Day, who was Mcains cell mate in Hanoi died the other day. This man was one of the highest decorated men in this country, honorable beyond description. He also joined the Swift Boat men to bring Kerry's faked military legacy to the attention of Americans. When a man of Days character, intelligence, and love of country speaks against the contrived heroism of another veteran YOU HAD BETTER LISTEN. Now why is it Kerry is Sec of State? Jerry... Kerry is Secretary of State because the President offered him this job and he accepted it. I'm afraid that this interesting fact has absolutely nothing to do with the death of Medal of Honor recipient Col Day the other day.